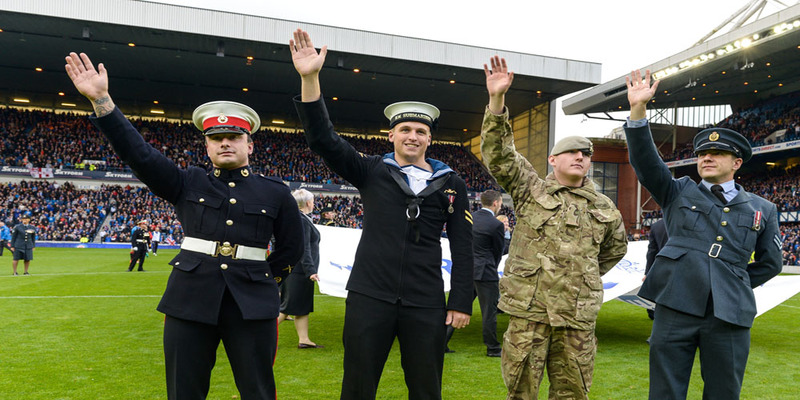 The Rangers Charity Foundation has a long and proud tradition of working with services related charities and was a joint signatory, along with the Club, to the Armed Forces Covenant in 2016. Over the last five years, the Foundation has donated over £125,000 in cash to armed forces and veterans’ charities, as well as significant in-kind support. Donations have included over £52,000 to veterans’ charity Erskine and £40,000 to ABF The Soldiers’ Charity, as well as donations ranging from £5,000 - £7,500 to many others such as Combat Stress, Poppyscotland, SSAFA, RNRMC and the RAF Benevolent Fund. Our Armed Forces Partnership selects services-related charities to work with each season and for season 2017/18 the Foundation has chosen to support AA Veterans Support in Northern Ireland, the Coming Home Centre in Govan and Erskine. We have pledged to raise £15,000 to be split between these organisations for important projects that will help improve the lives of veterans. AA Veterans Support (AAVS) provides vital services to those who serve or have served in the British Armed Forces and their families throughout Northern Ireland. The charity provides respite, treatment, training and welfare assistance and they have established Northern Ireland's first dedicated drop-in training and treatment centre, which provides advice and guidance, training, counselling and more all under one roof. The Foundation’s pledge of £5,000 will enable AAVS to continue to deliver and further develop the support services provided to the Service Community in Northern Ireland. Andy Allen founder of AAVS said: “As a small charity providing respite, treatment, training and welfare assistance to the Armed Forces Community in Northern Ireland the support of the Rangers Charity Foundation is greatly welcomed. “The Foundation’s support will not only enable AAVS to continue to sustain and develop the support services we offer, it will also help to provide much valued publicity of our work and the services we offer. To find out more about AA Veterans Support visit its website at www.aavsni.com or call 028 9074 7071. The Foundation’s pledge of £5,000 will be used to fund 200 meals every week for veterans for around four months. Encouraging veterans to spend time together eating is an important part of the Centre’s strategy. Many veterans exclude themselves and having lunch together is a great way for them to discover they are not the only ones who feel the way they do, and the peer support and camaraderie they enjoyed in the armed forces really kicks in. Coming Home Centre Operations Manager Ian Hopkins, himself a former Royal Marine, said: “This donation from Rangers Charity Foundation, will make a huge difference to the Coming Home Centre, and it is twofold, firstly feeding the troops is a huge financial commitment, but is ultimately the start of the healing process for many of our veterans, so vital in the work that we do. Find out more about the Coming Home Centre on its Facebook page at www.facebook.com/cominghomecentre or call 0141 237 8830. Erskine is Scotland’s foremost provider of care for veterans and their spouses, offering unrivalled nursing, residential, respite and dementia care in four homes throughout Scotland. Over the last five years the Foundation has been involved in a number of initiatives with the charity, including purchasing electric profiling beds for residents and a specially adapted minibus, refurbishing the Royal Scots Shop and contributing to the charity’s Centenary Garden project. This year the Foundation has pledged to help Erskine buy equipment for its new Activity Centre at its Reid Macewen Training and Conference Centre (RMTCC) housed on the Erskine Estate, Bishopton. With plans to open in December, the Centre will allow Erskine to extend its reach, by engaging with veterans who are living in their own home who do not need, want or qualify for long-term residential care. Attending the centre will be particularly beneficial to those who are lonely, socially isolated, and suffer from physical and/or mental health problems. The Centre will be a meeting place for up to 20 veterans per day and will provide opportunities for veterans to learn many new skills and explore a number of interests through the various classes on offer. The specific activities available will be heavily influenced by the veterans who attend, but the Centre is likely to include a TV/film room, meeting room for support services, a computer training suite, an arts and crafts room, recreation space for exercise classes, games, and to use the existing kitchen for cookery classes. It will also act as an open venue where veterans can access advice and support from other charities/organisations. The Rangers Charity Foundation has pledged to donate £5,000 in season 2017/18 to fund items such as arts and crafts materials, cookery equipment and utensils, basic exercise equipment, DVDs and computer software. Sara Bannerman, Head of External Relations at Erskine said: “We are immensely grateful to The Rangers Charity Foundation for their amazing support for this new project. Find out more about Erskine on its website www.erskine.org.uk or call 0141 812 1100.